You want food when you go to a restaurant. Yet the more popular ones first serve you a electronic hockey puck, a pager that promises to light up and vibrate when it is time to start waiting on food instead of tiny lights to blink and shake. Restaurant lobbies overflow into the parking lot some nights with people waiting on the promise that those pagers will light up calling them into meet the wait staff. 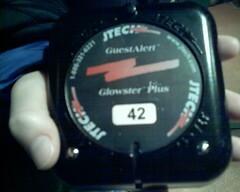 While I'm waiting, I like to watch people decide whether to take a pager after they are told how long the wait will be. Some have children (really good parents or really bad? ), others run in (why? ), only a few consult their partners (The least patient one asks?). Only a few turn away without a pager in hand. Allan Boesak talks about his life and witness as a Christian striving for justice. He says at the end of the day, the question is not, "Did I achieve the dream today?" but, "Did I believe in the dream today?" I hope you take a pager today and believe that the God's light will break out and shake the world again. Like the Volunteer Army, Volunteer Fire Departments quickly let you know that the volunteer option ended right after you volunteered. After you join, you are expected, required, to serve. Ohio Pastor Mike Slaughter in his book, Change the World writes about being servants instead of volunteers. Years ago a church member told me that being a volunteer meant you work when YOU want to work. Servant means working when and where you are needed. When the fire alarm sounds it isn't on your schedule. Folks are counting on you to serve those in need now, not yesterday when it was more convenient or tomorrow when you're more prepared. Pastor Slaughter sees more volunteers than servants, more members than disciples in congregations today. Folks that are filling an hour instead of fulfilling God's dream. The difference in motivation for servanthood was described by St. Benedict telling of three stonemasons describing a task they were all doing. ����"I am sanding a block of marble." ����"I am preparing a foundation." ����"I am building a cathedral." I hope you don't volunteer to sand rocks, but serve in building up God's home for humanity. This year, Akron Kiwanis President Mark Fairhurst gives thoughtful and topical prayers to start monthly meetings of the Akron Roundtable which Akron Kiwanis founded. Sometimes I get a copy. Here's this month's offering reflecting on the visit of Joel Smirnoff, President, Cleveland Institute of Music speaking on the topic: "Music and the Young Musician, Past and Future"